Phew! We launch. Wind has dropped a bit. It is still blowing a 4 from the north east and while not the best weather ever – the near sites are doable. 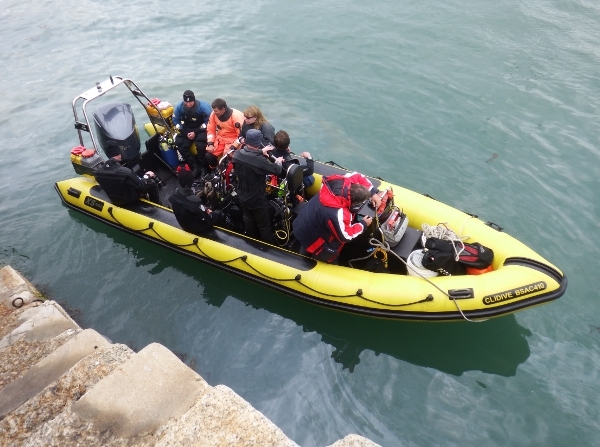 The first dive of the day is on The Bucks near Lamorna Cove. It is still a bit lumpy but everyone is relieved to find the visibility better than expected after the last few days of big seas. There is no sign of plankton and it is bright at 30m depth with 5m+ viz. A few people located the cave can report it is inhabited by a conger and a crawfish. After lunch we check out the Alice Marie. Lots of free swimming congers, one dead conger being eaten by starfish and one conger sitting surrounded by 10 shrimps. Viz now 7m+ so things are getting better. Dive planning done over a lasagne back at Kenegie. Winds dropping right down tomorrow. Hoping the swell will do the same.